Using the Hubble Space Telescope, astronomers have investigated the relationship between monster black holes that power radio-signal-emitting galactic jets and galaxies that have undergone mergers. Dr Marco Chiaberge and his colleagues surveyed several galaxies — known as active galactic nuclei (AGNs) — galaxies that producing the most spectacular fireworks in the universe: jets of material shooting out from galaxies’ centers into space that stretch for thousands of light-years. Astronomers believe that most galaxies host a supermassive black hole at the center but only a small percentage of them have been seen producing these galactic jets, known as relativistic jets — two streams of matter are emitted along the axis of rotation of an active galaxy moving at nearly the speed of light at right angles within an accretion disc, diffused material encircling supermassive black hole. The heated material shine brightly in the radio spectrum, the origin of radio waves. But why some galaxies have jets and some do not? To answer this question Dr Chiaberge and co-authors investigate five categories of galaxies: two type of AGNs that produce jets and two type those don’t, as well as non-AGN galaxies with no jets. The galaxies that host these relativistic jets give out large amounts of radiation at radio wavelengths. From there, the team looked into the history of these galaxies and found that more than 90% of the surveyed AGNs with jets were associated with galactic mergers. By using Hubble’s WFC3 camera we found that almost all of the galaxies with large amounts of radio emission, implying the presence of jets, were associated with mergers. However, it was not only the galaxies containing jets that showed evidence of mergers! Artistic illustration of high-speed jets from supermassive black holes. © ESA/Hubble, L. Calçada (ESO). We found that most merger events in themselves do not actually result in the creation of AGNs with powerful radio emission. Said Roberto Gilli ~ author on the paper. About 40 percent of the other galaxies we looked at had also experienced a merger and yet had failed to produce the spectacular radio emissions and jets of their counterparts. 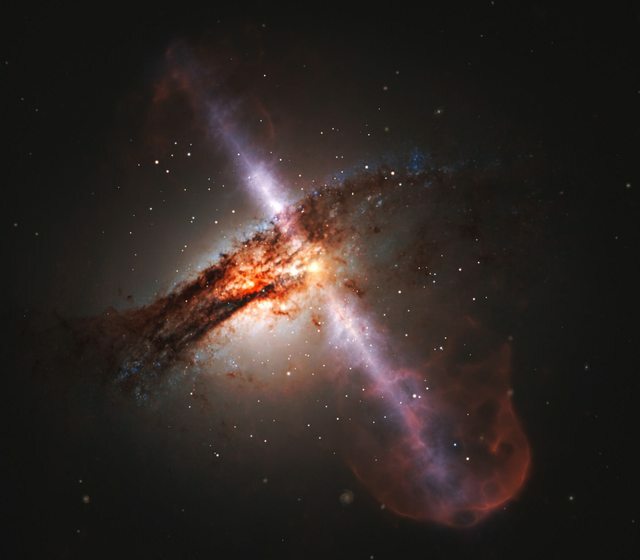 Wthough it is now clear that a galactic merger is almost certainly necessary for a galaxy to host a supermassive black hole with relativistic jets, the team deduced that there must be additional conditions which need to be met”. There are two ways in which mergers are likely to affect the central black hole. The first would be an increase in the amount of gas being driven towards the galaxy’s centre, adding mass to both the black hole and the disc of matter around it. Explains Colin Norman, co-author of the paper. But this process should affect black holes in all merging galaxies, and yet not all merging galaxies with black holes end up with jets, so it is not enough to explain how these jets come about. The other possibility is that a merger between two massive galaxies causes two black holes of a similar mass to also merge. It could be that a particular breed of merger between two black holes produces a single spinning supermassive black hole, accounting for the production of jets. The team said that future observations are needed to shed light on why this complex and powerful processes.